Vedantu.com - No.1 online tutoring company in India provides you the Free PDF download of NCERT Solutions for Class 6 Science Chapter 7 - Getting to Know Plants solved by Expert Teachers as per NCERT (CBSE) Book guidelines. All Chapter 7 - Getting to Know Plants Exercise Questions with Solutions to help you to revise complete Syllabus and Score More marks. Register for our free webinar class with best Science tutor in India. NCERT Grade 6 Science Chapter 7, Getting to Know Plants helps the students to know the different parts of any plant.This study will help them to understand the differences between plants of different kinds.The chapter begins with the introduction of Herbs, Shrubs and Trees through an activity that makes the students observe different plants and classify them based on their height, their colour, thickness and branch position. Such activities help to invoke the scientific curiosity amongst the student. Terms such as climbers and creepers are also introduced to the students.The next sections deal with different parts of the plant such as stem, leaf, root and flower. Each part has a dedicated section that explains the part in-depth with its pattern of growth and types. NCERT Grade 6 Science Chapter 7, Getting to Know Plants describes each type of plant and parts of the plant with the help of colourful diagrams and simple language to help to understand better and enhance the learning experience.Technical terms such as lamina, venation, petiole, transpiration, etc. includes the parts of the plant and their detailed description. 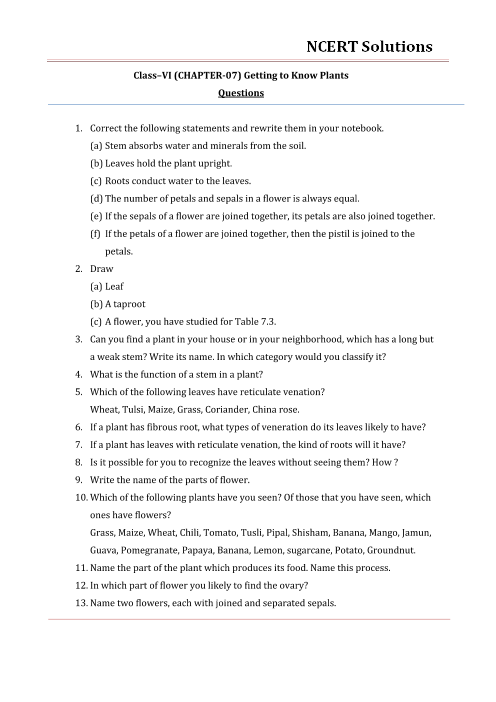 Get 100 percent accurate NCERT Solutions for Class 6 Science Chapter 7 (Getting to Know Plants) explained by expert Science teachers. We provide solutions for the questions given in Class 6 Science textbook as per CBSE Board guidelines from the latest NCERT book for Class 6 Science. The topics and sub-topics in Chapter 7 Getting to Know Plants are given below. Chapter 7 - 13 Questions with Solutions. Other than given exercises, you should also practice all the solved examples given in the book to clear your concepts on Getting to Know Plants. Download the free PDF of Chapter 7 Getting to Know Plants and take the print out to keep it handy for your exam preparation.